We recently completed our 2013 Upgrade to accommodate more full time campers. 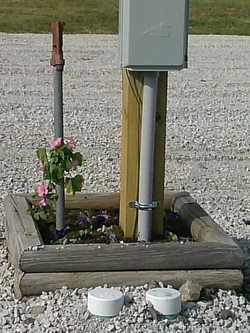 We are a small campground with 22 sites, but we have upgraded them all with sewer hookups and 50 amp service. 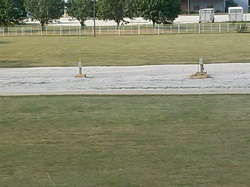 We have poured new gravel over our existing gravel so the sites have a solid base. We've also added 4 more sites, and hope to expand that to even more if possible. Each double campsite location has 2 sewer hookups, water, and 2 new 50 amp electrical outlets. We have some permanent full time spots with shade, and although they might be reserved now, you can put your name on the list to be the next in line. Here's a side view of our sites. 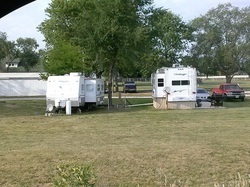 Each location has facilities for a camper on each side. These are approximately 28 to 30 feet apart and can accommodate two trailers staggered between hookups. 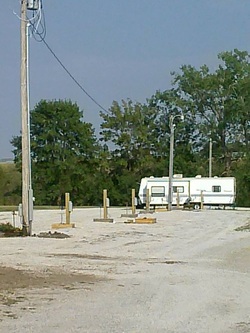 We allow for parking to the front or rear of your trailer and all along the perimeter of the park on the grass. Here's a view of our park from the corner of Business I49 (Formerly 71 Hwy) and D/F Highway. We keep the place mowed and well maintained.